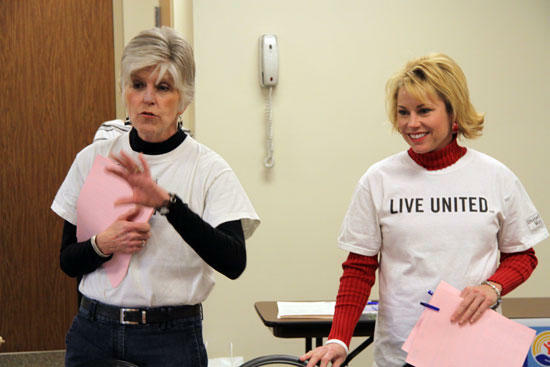 United Way volunteers Denise Esker, left, and Carolyn Tumbleweed tell Stones River Hospital employees about how to sign up for the campaign Friday. Friday was a chilly day outside, but it was a hot day for chili inside Stones River Hospital as various departments held a chili cooking contest in support of United Way. The prize for winning the contest was a trophy, but the real winner was the United Way as employees who ate "voted with their pocketbook" by making a contribution to the organization that supports nearly 50 local community organizations. To make a contribution to United Way, you can do so at one of Woodbury's three banks, or go online to http://www.uwcannon.org. You can also show your support by signing up for payroll deduction if it is offered at your place of work. The United Way stresses that every dollar it raises in Cannon County will go toward the support of local organizations. United Way brings together people from all across Rutherford and Cannon Counties - people from government, business, faith groups, nonprofits, academic institutions and the general community - to tackle issues that matter most. If it requires fundraising, collaboration, or just getting people to talk about the issues, that's what they do. United Way says it is focused on the bottom-line results: the lives we change and the communities we shape.